Number five: Aquaculture Accounts for Over FIFTY Percent of Stripers Sold – In fact, it’s closer to sixty percent. 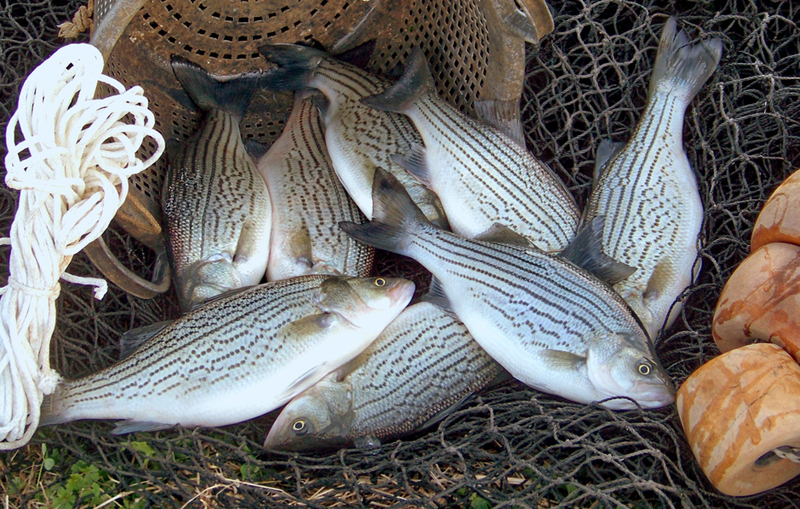 Hybrid striped bass production is one of the fastest growing forms of aquaculture in the United States. Annual production has increased over two-hundred percent in recent years as scientists refine efficient and highly productive ways to raise stripers. Commercial fishing for wild striped bass has a long history in Maryland, but don’t let anyone fool you into thinking you couldn’t eat stripers if they weren’t caught in the Chesapeake Bay. In fact, you’ll eat better if you eat farm-raised fish. Those of us who catch and eat fish right off the boat are used to great-tasting fish, but hybrid stripers have a slightly sweeter flavor and a more delicate texture than wild-caught fish. They don’t contain the high levels of mercury and PCBs found in Chesapeake Bay rockfish, so it’s safer to feed them to your family. Striped bass aquaculture is a sustainable method for providing healthy , high-quality fish to restaurants, grocery stores, and seafood markets. In stark contrast, a recent effort by the Department of Natural Resources to get wild-caught striped bass deemed sustainable in Maryland, failed. Number Four: Stripers Have FOUR Nostrils – Okay, if you’ve attended any of my “Strike Triggers” presentations, you probably know this one. Look closely at the next striper you catch. Unlike most fish, linesiders have a pair of nostrils on both sides of their nose through which water enters. Each nostril has two openings separated by a thin membrane of skin. Water circulates continuously through these short passages where tiny hairs detect odors and transmit them to the brain. Stripers can smell a lot better in the water than you can in the air, maybe even a hundred times better. Many researchers believe that striped bass develop an even better sense of smell as they get older. Some studies suggest that bass are repelled by smells they don’t like such as sun block, bug spray, or petroleum products. If you add scents to your lures you’ll attract more and bigger fish and you’ll mask the bad smells stripers don’t like. In my book, Chesapeake Light Tackle, An Introduction to Light Tackle Fishing in the Chesapeake Bay, I tell you how. Number Three: At Least THREE 100+ Pound Stripers Have Been Documented – When left alone, striped bass can generally grow to lengths of up to 59 inches and weigh 55 to 77 pounds. Oh, but there are occasional monsters. The largest striped bass on record is a 125-pound female caught off Edenton North Carolina in April, 1891. A striper of 112 pounds – said to have been at least 6 feet long – is recorded from Orleans, Massachusetts. A striped bass of 100 pounds was taken in a herring weir in Casco Bay, Maine in the 1880s. 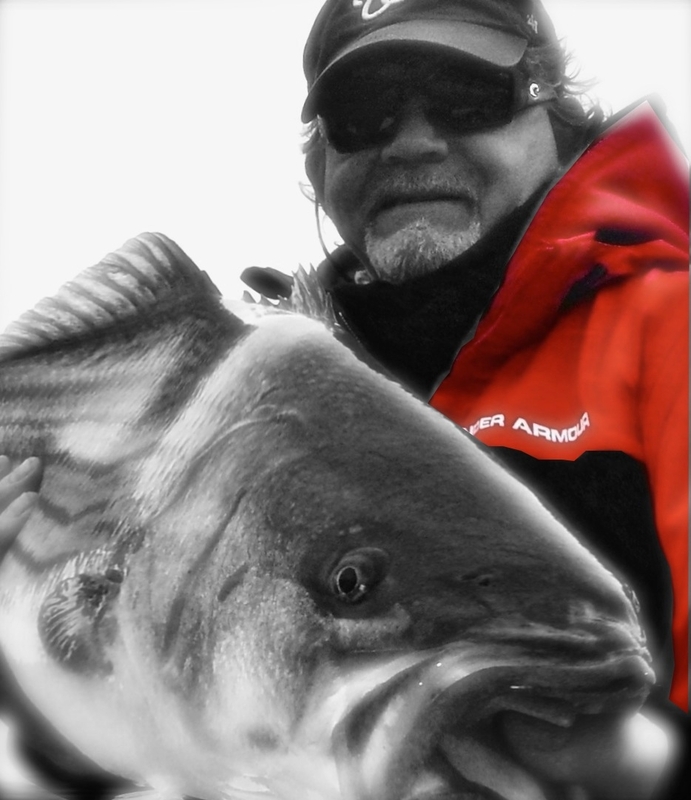 Are big stripers unusual? You bet, but in 1876, a haul-seine off the beach of Avoca, North Carolina netted 350 striped bass averaging 65 pounds each. The world record for hook-and-line is 81.88 pounds taken by Greg Myerson fishing off the coast of Westbrook, Connecticut. In the Chesapeake Bay, the striped bass record is just under 68 pounds but bigger fish have been caught and released by both hook-and-line and nets. A 92-pound striper was netted by the Maryland Department of Natural Resources at the mouth of the Patuxent River during a research project in 1995. 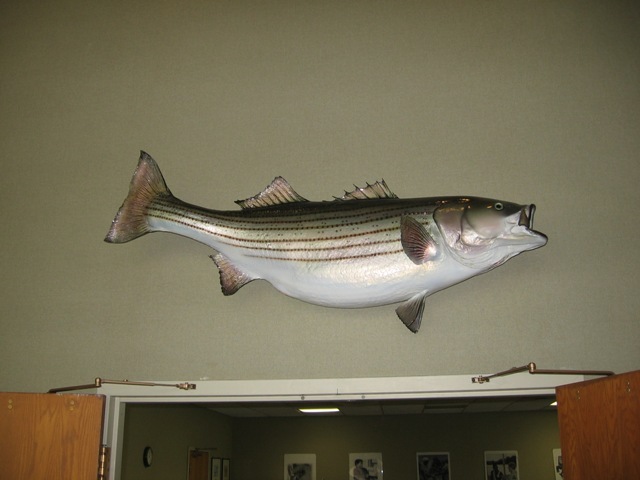 A replica mount of that fish hangs in the Tawes Building in Annapolis. In May of 1992 Maryland Charter Boat Captain Ed Darwin boated a 56-inch striper that the experienced captain estimated to be more than 80 pounds. Because it was a pregnant female, he let her go. There is purported to be video of that fish. I’ve personally seen fish landed that I think would break the Maryland state record, but because current law requires fish to be killed and doesn’t recognize catch-and-release records, stripers caught during the winter can’t be counted. Number Two: A Scale Can Reveal TWO Important Things About Your Fish – Examined under a microscope, a scale can reveal the age and size of your fish. The winter is a period of slow growth for stripers, during which a series of closely spaced rings form around the edge of each scale. 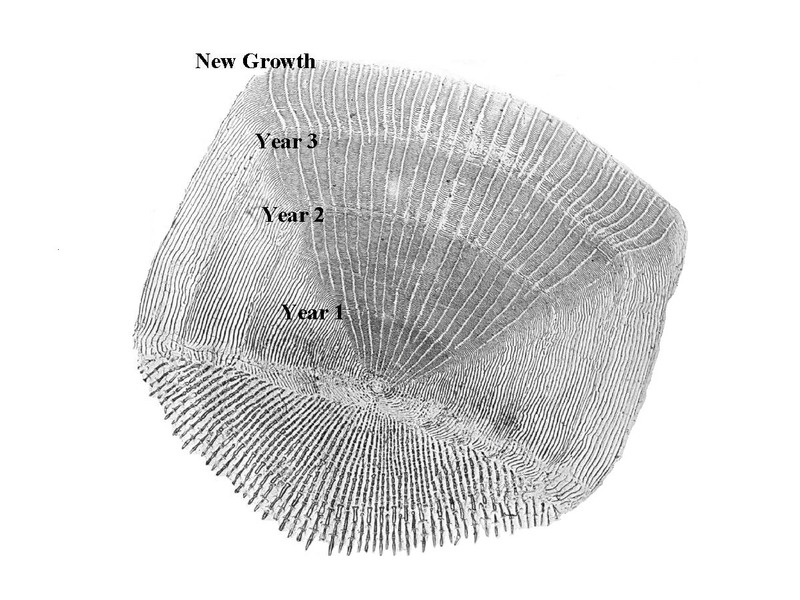 Similar to counting rings in the trunk of a tree, the age of an individual fish can be determined by counting the number of rings, called annuli.The examination of many thousands of scales has provided a reliable database for determining the rate at which striped bass grow. On average, bass are four to five inches long at the end of the first year, 11 inches at the end of the second, 16 inches at the end of the third, and 20 inches at the end of the fourth year. A striped bass that is 36 inches long normally is about 12 years old. A bass 48 inches long, and weighing over 50 pounds, is over 20 years old. The oldest documented striper was 31 years old. You can sometimes count the rings on the scale of a large striper yourself by looking at them with a magnifying glass. Number One: Stripers Are Responsible for The FIRST Fisheries Management Law in America – Yup, in 1649 the General Court of the Massachusetts Bay Colony banned the use of striped bass as fertilizer. Stripers were once that plentiful. For 362 years we’ve been struggling to manage the harvest of striped bass. In 1770, the New Hampshire government declared “fishing hath almost extirpated the bass and bluefish in the Piscataqua river.” In 1793, due to complaints about fewer fish, a law was passed in Newbury, Massachusetts outlawing the netting of striped bass. Because stripers migrate into rivers and tributaries along the coast, they”ll always be vulnerable to over-fishing. 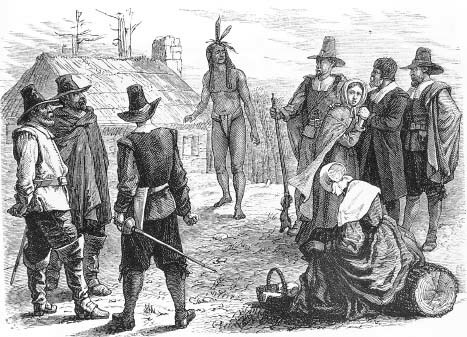 Very little has changed in the past three centuries. A new stock assessment is expected this month to determine the success of current management techniques. How do you think it will turn out? Sources: All of the facts above are well documented and sources are provided by request. Thanks to good water quality, fishing continues to be excellent in the Maryland part of the Chesapeake Bay though the last week of June. Most light tackle fishermen are casting in areas south of the Bay Bridge, specifically Hacketts Bar, Tolley’s Point, Gum Thickets, Poplar Island and south to the Hook. A few fish are starting to show up now around the False Channel. In my last entry I tweeted about fishing in Eastern Bay. That bite has slowed considerably. There are some small fish breaking in the vicinity of Poplar Island. I’m finding nice white perch around the shallow bridge pilings and around shoreline cover. I’ve yet to catch a redfish or speckled trout around Poplar Island or in Eastern Bay, but I am hearing of some being caught. Please let me know if you catch any. I’m somewhat concerned about how run-off from this week’s heavy rains will affect our fishing through the upcoming July 4th weekend. One things for sure, there will be a lot of people fishing and I guess we won’t know if we don’t go. Look for my boat, Thunder Road at the fishing hotspots and fireworks shows this weekend and please stop by and say hello. Happy Independence Day! This is interesting information. I knew about the scales and I heard about the 125 pounder. Thank you for another interesting article. I like the last picture. 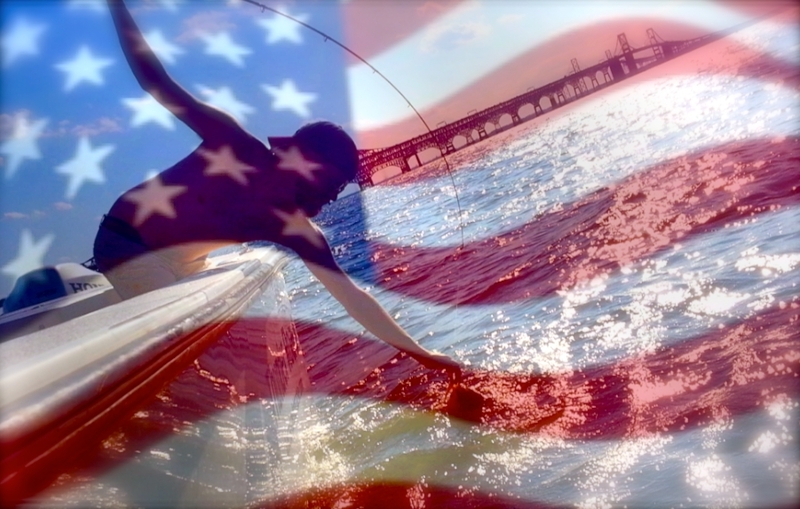 Happy 4th of July to fishermen all over the Chesapeake Bay! Only one problem, you forgot to mention that farm raised fish require feed made from fish meal which is usually menhaden. Sustainable? I think not. Terrance, you bring up a good point. I’m sure you’ll be interested in this article from the Baltimore Sun. http://articles.baltimoresun.com/2012-08-19/features/bs-gr-vegetarian-fish-meal-20120819_1_fish-oil-aquaculture-striped-bass Scientists at the Institute of Marine and Environmental Technology have perfected an agriculture based fish food that even stripers like – no menhaden required! I’d hate to think I had to eat farm raised fish. Speaking of hybrids, when is the last time you caught a white bass? Several years. Actually, Dianne caught one on Cherokee last time I fished there. Miss those days. All in on the next world record striper coming from the Chesapeake! Interesting post – thanks Shawn. Speaking of water clarity in the bay this weekend… I live up the Susquehanna and it takes me 1hr 45min to get to Sandy Point where I usually put in my boat. The river is high and muddy and still rising today. Is there a good site or source of information where we can check muddy/clarity conditions of the bay before we run the whole way down there. I can check tides, currents, wind, etc – but I’m not aware of anywhere to check on dirty/clear conditions. Toms, in addition to J.P.’s excellent advice, I occasionally tweet water conditions when I’m fishing or just crossing the Bay Bridge. toms, you can check the turbidity/clarity of the Bay’s mainstem (and a lot of other data) in near-real-time by accessing NOAA’s “smart buoys” at http://www.buoybay.noaa.gov. The Patapsco Buoy, just outside the mouth of Bodkin Creek on Six-Foot Knoll, is close enough to Sandy Point to give you an idea of what is going on there. The site can also give you a sense of what the optical turbidity units (NTUs) mean in the real world (over 20 is starting to get cloudy). Note also that an algae bloom (high Chlorophyll a) can mess up clarity (as well as dissolved oxygen). By the way, there is a free smartphone app for the buoys, and you can call them for data at 1-877-BUOYBAY (1-877-286-9229). Shawn and I both carry the app on our phones. Shawn, in his remarkable book “This Was Potomac River,” Capt. Fred Tilp quotes the Alexandria GAZETTE from the spring of 1839 about a haul seine catch from the Sycamore Point beach at what is now the Mason Neck National Wildlife Refuge–300 rockfish averaging 55 lbs. We’ve learned some hard lessons about fishery management since then! Thanks for the information, J.P. Folks, if you haven’t already, pick up the July issue of Chesapeake Bay Magazine and check out John Page’s article, “Smartphones Pay Off for Smart Anglers.” It includes more information (including screenshots) about useful apps for iPhone and Android. Shawn, I was curious about this. Do you have any source or study that you can point to back up this up with data? I know fish may have some pollution in them from the food chain for example eating bait fish that filter the surface water, ect. Any thoughts or comments would be helpful. Thanks in advance. Yes, and I’m glad you asked, Mike. I’m always happy to cite sources for any facts I put out. Maryland DNR doesn’t talk about this too much, but they’re required by federal law to provide consumption advisories for any fish that might contain high levels of toxins. For striped bass over 28 inches, it’s one 8-ounce portion (about the size of a deck of cards) every month for adults and one every other month for children. Under 28 inches and they say you can safely eat three portions per month except for children who should eat only 2 portions. Keep in mind that this is data from a state that is very protective of the commercial striped bass fishery. Some states advise less and even against eating striped bass at all from some tributaries and remember, these are migrating fish. Use your best judgement but keep in mind that your kids don’t have a choice about what you feed them. I had no idea about the consumption advisories. That’s very sad. I didn’t know a lot of that stuff!! thanks!